I know some of you folks are curious about my take on the recent Democratic Primary here in the City of Albany. I had refrained from commenting immediately because, well, I had nothing to say. Not yet. Actually, I’d written several pages of spitting invective that came dangerously close to slander. Some might find such writing amusing, but it wasn’t going anywhere worth reading. Okay, I’m glad I calmed down and waited. The other night I found the definitive answer to a question that had been bugging me, why does newly reelected Mayor Jerry Jennings look so distressed? This is a guy who has just turned back a tremendous challenge, defeating His opponent Corey Ellis 56 percent to 44 percent. Not only that, but He has managed to retain solid control of the Common Council. Why the long face? Exhaustion is certainly part of it, but there’s different kinds of exhaustion. I saw triumphant exhaustion on His face after He roundly defeated Assemblyman Jack McEneny’s challenge in 1997. He strutted around town crowing like the last surviving rooster in a barnyard full of laying hens. Indeed, from that electoral triumph until about the middle of this decade He reigned over Albany the way Joe Stalin ruled Russia, supreme and untouchable. Looking at some recent photos of the man taken this past month, one might get the impression from the look on His face that this rooster is about to be shipped off to the hot dog factory. I think I know what’s bothering Him. A few nights ago we had a candidate’s night at the Council of Albany Neighborhood Associations (CANA) meeting at the main library on Washington Avenue. Despite the unusual program attendance was light, no more so than a run of the mill meeting. No surprise at that, the last few races in the City that still need to be decided in November are forgone conclusions. This was the first opportunity I had to listen to a public address by our next Treasurer, Kathy Sheehan. She still has to dispose of a Republican opponent next month. Ms. Sheehan is a bit height challenged, but after listening to her I believe she’ll be hitting her head on the ceiling of the City Hall rotunda after she takes office. You see, in the months before the September Primary a lot of candidates used the buzzword “transparency,” which unless I’m mistaken was introduced last spring by Shawn Morris. The concept behind the word, as Ms. Morris explained it, is to open up all levels of City government to full public scrutiny and to require (not allow, require) the opportunity for public participation in decision making wherever possible. As we all know, implementation of such a sensible policy of transparency would be a radical and revolutionary departure from the secretive behavior of the current regime. By the end of August, long after Ms. Morris had dropped out of the mayoral race, the word transparency was in danger of becoming trite. I even heard several of Jerry’s candidates use the word, in passing and without explanation of course. Now Kathy Sheehan was standing before us glowering over the top of the lectern proclaiming that she intends to bring transparency to the City of Albany annual budget. She consistently coupled “transparency” with the word “accountability.” Without doubt she was one hundred percent serious, the campaign was effectively over and it was time to discuss how she would implement these words as public policy. After January there will be no more secret budget items that cannot be explained, no more fast and dirty transactions that could not be traced. Can she do that, or was she blowing smoke? In the question period after her presentation I asked her, what will you do if The Mayor withholds vital information from you? He did that to the last two Comptrollers, Tom Nitido and Nancy Burton. 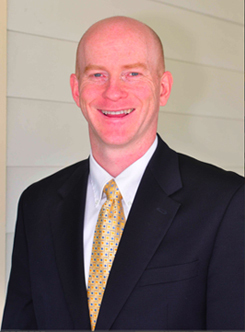 Nitido was reduced to filing suit against the City to obtain information, with little success. In response I learned that the Treasurer’s existing computer and database are completely separate from other City computer systems. “As Treasurer,” Ms. Sheehan explained, “I will have control of the computers and the database.” So The Mayor can no longer control City records by controlling the office of Treasurer. Later when I got home, The Wife pointed out to me that current Treasurer Betty Barnette is probably going to be shredding a lot of documents between now and January... with The Mayor right beside her supervising. We can be sure that the database that Ms. Sheehan is going to inherit will be woefully out of date and inadequate for a modern community. We should not be surprised to learn next year that the Treasurer’s records will be riddled with unexplained gaps and omissions. Ms. Sheehan is going to have a lot of work to do. Save the Pine Bush, among others, has been asking for this for years, what she’s saying is like a dream come true. And Ms. Sheehan made it clear that such accountability and transparency would guide all of her actions as Treasurer. Imagine such a thing in Albany. Morning is almost upon us. Can Kathy Sheehan be corrupted, can Jerry Jennings buy her off like he’s done to so many others? You can bet that He will try. I very much doubt that He will succeed. Ms. Sheehan is first and foremost an accountant who worships the numbers, a politician second. From what I’ve seen and heard of her I can’t imagine that her strong personality would allow her to deliberately distort information for political expediency. To illustrate this, she made a pledge to introduce and follow GFOA ethical standards for both herself and for her staff, another first. And it’s clear that she anticipates Jerry’s machinations and His wrath. “To avoid the appearance of conflict of interest,” she said, “I am not accepting campaign contributions from corporations.” I take this to indicate that she is ready and willing to tangle with a Mayor who throughout His time in office has been very accommodating to corporate exploiters. Oh yeah, Jerry has a lot to worry about with the new Treasurer but she’s only half of His problem. After Ms. Sheehan spoke we heard from Leif Engstrom, who announced to us that “I am the only Citywide candidate who is not facing an opponent in November so that makes me the Auditor elect.” Yes, he’s about as charming as a parking enforcement officer. He almost sounded like he believed that he is preparing to take charge of the City. He’s perfect for the Auditor job. Listening to him I had this vision of him stomping around City Hall with a pissy expression on his face kicking over dusty old piles of crap and growing more and more furious. As I mentioned before the Primary, Mr. Engstrom utterly detests me for reasons that I fail to comprehend. I’ll bet I could start a club with all the people he annoys, we’d have to rent an auditorium for our meetings. But that’s of no consequence. I am more than willing to concede that Leif Engstrom has always given me a strong impression of public integrity and is extremely unlikely to be bought off. I think his pride and his ego would not allow him to sell out for mere beans and promises like so many others have. In any case, I don’t think that Jennings has access to anything big enough that might possibly tempt Ms. Sheehan and Mr. Engstrom. About ten years ago Jerry Jennings was able to induce the Charter Reform Commission (which He effectively controlled) to replace the job of Treasurer and the job of Comptroller with a Treasurer and an Auditor. According to Ms. Sheehan, the new Treasurer absorbs most of the functions of the old Comptroller. I guess that means whatever's leftover from the hybrid combination of the two old jobs will fall to the new Auditor. The change of jobs officially kicks in this January as scheduled. The Wife is convinced that He did this rearrangement of financial responsibilities merely to get former Comptroller Nancy Burton out of City Hall, but I think that’s only part true. I believe His idea was to divide financial duties between two individuals so that if necessary, He could play them off against each other and thus continue to keep the nosy taxpayers out of City records. Now it appears that He made a very serious error by not thinking this all the way through to the present day. I suspect He never imagined that two highly competent and incorruptible pros would capture both offices and pledge to work with each other to clean up City finances. No wonder He looks so worried. What’s He going to do now? Before the Primary I was feeling very discouraged because I could see that Jennings was going to retain control of the Common Council for another four years. But perhaps He should have spent less time and money running tools against Common Council members like Dom Calsolaro and Cathy Fahey. In retrospect maybe He should have let the Council go hang and deal with the more serious threat closer to His person. The Republican candidate, naturally, claims that she wants to “lower taxes.” How, as Treasurer, was she going to do that? “By raising City revenues,” she told us, and shared some of her ideas. 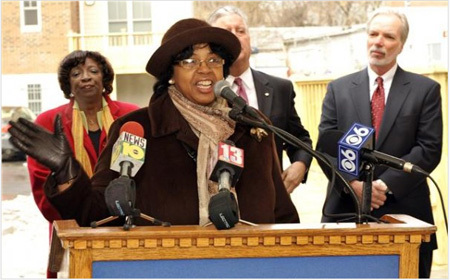 Her best notion was to “transform the Harriman Campus” which she wants to do to increase the City’s “tax base,” a deservedly defunct term that usually means “give away public assets.” She neglected to explain how she planned to induce The Mayor to go along with this bright thought, some among us have been offering Him solid Harriman plans off and on for years with little success. McGinn called for more parking because “parking in the City is scaring people off.” That made me wonder if she actually lives in the City. She’d like to replace coin operated parking meters with “smart cards” because, you see, sometimes you can’t find a quarter, so instead you could just pull out your card . . .
And in her capacity as Treasurer she would like to install “amber alert” devices, which as best as I can understand are supposed to help prevent child abductions. As we all know, this is a so much more pressing problem than, say, gun violence. Fortunately for her she quickly conceded that the alleged “six or seven recent cases of (attempted) child abduction” all happened in “nearby communities” (the suburbs) but hey it could happen here. No one wanted to bother her with questions, so I asked her about the Rapp Road Dump. She looked quite serious as she explained that “we need to think about what we’re going to do seven years from now” when Jerry’s latest attempted Dump expansion is scheduled to require yet another expansion into the Pine Bush Preserve. Isn’t that precious? Perhaps she should become acquainted with the issues if she decides to run for office again in the future. 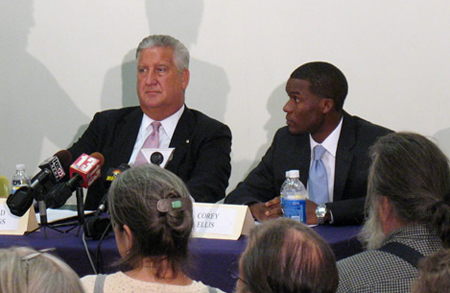 The September CANA meeting, which was held ten days before the Primary, featured Jennings and challenger Corey Ellis in a formal debate moderated by the League of Women Voters. The too small meeting room in the back of the main library was packed beyond capacity with voters and various kinds of media, with a dense crowd of more voters outside the door straining to hear inside. Out on the main floor of the library about six or seven groups gathered around laptops watching live feeds of the debate put out by several TV stations that were inside the meeting room. I spoke with Mr. Ellis briefly about five minutes after the debate ended. “The questions were disappointing,” he said. A few moments later as I was slowly leaving the premises I heard a fair number of spectators make the same criticism. The general feeling was that the questions given to the candidates were shallow and overly general, and that the real incisive issues were avoided. The general blame for this fell upon the League of Women Voters moderator. The format of the debate was typical for the League, questions were collected from the audience on 3 x 5 file cards which were laid out, selected and edited. It was the editing that left people feeling cheated, everyone I talked to knew that key questions that everyone wanted answered had been, well, effectively censored. I doubt that this was deliberate. It was clear to me that the moderator, a suburbanite, was unfamiliar with urban issues. I’m told that it is strict League policy to choose a moderator from outside the community, this is supposed to ensure fairness and nonpartisanship. All well and good, but eliminating incisive questions for whatever reason tends to favor the incumbent, especially if He is vulnerable to these issues. During the debate Jennings was very much on the defensive with His poor record, but the consensus was that He managed to hold His own. From the audience I was struck by The Mayor’s uncharacteristic nervousness, so different from past elections where He conducted Himself like He wanted to get into a fistfight with His opponents. A week before the Primary it was already evident that He had something unpleasant on His mind. Most felt that Corey Ellis performed adequately but failed to take enough opportunities to attack. I’ve been told that Mr. Ellis indeed was holding himself back for the big questions that he thought were coming. 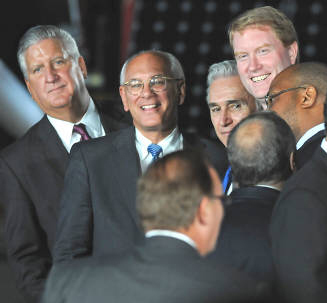 The debate was pretty much a draw, which means it was an effective victory for The Mayor. Oh, one more thing. Carolyn McLaughlin, looking serene and presidential, was the first to speak at the October CANA meeting. 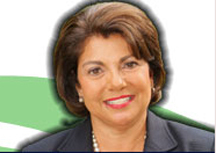 She had effectively trashed her dilettante opponent in the Primary race for Common Council President, but while he appears to have given up campaigning he is still on the Conservative line for November. Carolyn gave a measured, low key speech that impressed the audience, I’m beginning to think that her speechifying abilities may carry her far. In the question period I asked her about balance of power, would she support efforts to transfer financial control and oversight from the mayor to the Common Council? Initially taken by surprise, she expertly blew off the question while seeming to answer it. Yes, Carolyn McLaughlin has arrived. Before the meeting I gritted my teeth and walked up to her to offer my congratulations. She gave me a big beautiful smile and thanked me for my support. Not knowing when to shut up, as usual, I told her I thought she’d smack me for what I’d written on this blog. The smile evaporated, she rolled her eyes and said, “I’ll take whatever I can get.” She turned away from me with a look of annoyance before she even finished the sentence. Like I said before the Primary about my relationship with her, oh well. I find it hard to believe that Ellis was 'holding himself back' in anticipation of the more serious and hard-hitting questions he thought were coming. If you were there 30 minutes before the start you might have noticed 'CJW' distributing a list of acceptable questions to volunteers/supporters like myself for us to write on our cards. I heard a good amount of the questions on the list asked, they were all softies and he saw them beforehand obviously. I was conflicted about whether to participate in submitting flub which he had been coached on or more specific invective which he may or may not be able to seize on. I went with the latter, but it was not read - maybe never gotten to or maybe censored. Side note: I'm not condemning the strategy entirely because if we wrote down what we wanted most likely, as you say, none of our questions would have gotten past that moderator! No doubt this was a consideration. I learned a lot about campaigning in Albany from the expert foresight of people like CJW. Come on, now. Corey was disappointed in the questions and holding himself back for the big ones? Laughable nonsense straight out of the Excuse Machine. Smart politicians give the answers they want to give, no matter what the questions are. Corey had his chance, and he blew it. I'm sick to death of Jerry, but I'm also fed up with all the limp excuses about why Corey wasn't a better candidate. Let's all just face the fact that a stronger challenger could have beaten the mayor. No "limp" excuses or whatever else you're reading into it, emmo. Obviously, if Corey held himself back as I've been told, it wasn't a very good debating strategy, eh? Played right into the incumbent's hands. As for this distributing "acceptable questions," that's the first I've heard of that. Didn't see it. I'd be interested to hear confirmation of that, and whether or not the other side did something similar. BTW, I arrived almost an hour before the start and talked to a lot of people. I sat about five rows back next to one of Corey's chief strategists. No idea who CJW is. 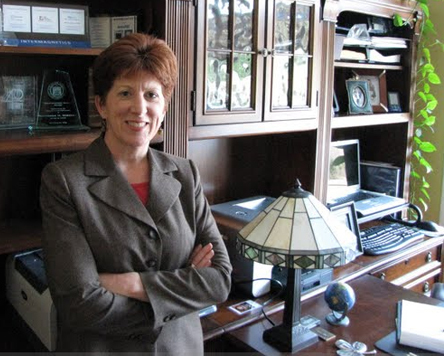 Why was Kathy Sheehan campaigning in NYC? And why at Rockefeller Plaza? 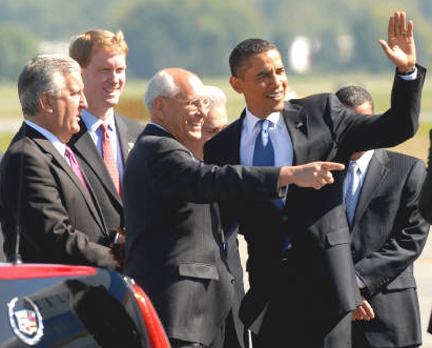 The pretty boy with red hair in the Obama photo is Scott Murphy (NY-20) correct? CJW is Carol June Washington. Lovely woman...used to work with Corey at Trinity. I taught her how to obtain voter registration records and how to extract them into a "easily analyzed" format. All while whispering in the peanut gallery of the council chamber....ahhh, I'll forever be a peanut. I didn't see CJW or anyone distributing "acceptable questions" at the debate but it wouldn't have been a stupid thing to do prior to entering the room. I would have suggested it...then packed the room. Which, I might add, seemed a little Corey slanted....too bad they didn't really execute the question strategy as well as they might have. Perhaps the fair campaign folks could look into the concerns of those questioning the possible censorship of their questions....oh yeah, that's right, Mr. Ellis didn't sign on to abide by fair campaign strategies. Actually, in my humble opinion, the group seemed more of a lynch mob than an audience. If BJ can garner sympathy from me, you better believe the room really did feel hostile. I woulda been nervous too. 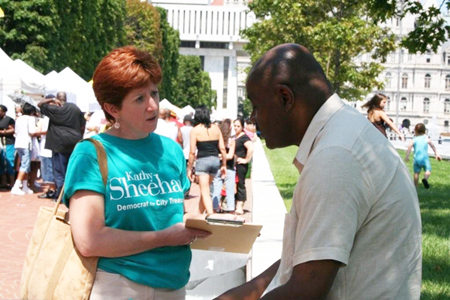 Common Sense...Ms. Sheehan was campaigning at the Empire Plaza...downtown Albany. Family in tow, she seemed to be really enjoying the campaign. I just love people who enjoy what they do. She is a sincere campaigner and she will be a wonderful treasurer. Gabe - That is indeed Scott Murphy of the 20th. He is a Blue Dog, one of the so-called Democrats who have been working hard to derail Single Payer Medicare For All, and to sabotage even the lame "public option" from the Health Care bill before Congress. Washington Ave Mao - Apologize to a dilletante wasting everybody's time? No. 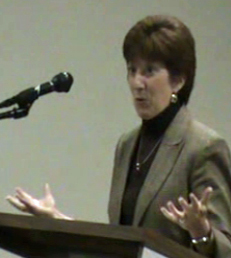 What Ms. McGinn did not do was outline a plan to deal with the City's fiscal crisis. Clearly she had no clue. As for the parking meter cards and the stupid red light cameras implemented by Ms. Sheehan, those were clearly an afterthought. For Ms. McGinn that was the whole plan.